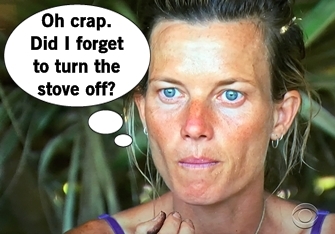 Survivor Ghost Island: Can It Get Any Malolower? Survivor decides to shake things up again and shuffle tribes once again, this time to three tribes (orange, purple, green - Mardi Gras!) 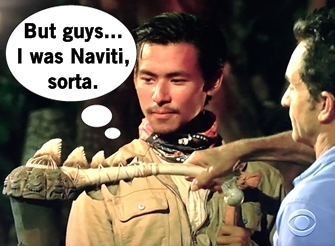 Original Malolo is screwed yet again as each new tribe retains an original Naviti advantage. Yanuya is Chris, Sebastian, Wendell, Jenna, and Laurel and don't seem too burdened by restarting their entire camp life from scratch. While Wendell and Laurel escaped the Chris vs. Dom drama, they are both still stuck hearing all of Chris' stories of one-upsmanship and "huge" reveal that he's a model. Over at Malolo 3.0, Michael and James are reunited but weren't really allies before but maybe stuck together now. They hope that James' relationship with Angela from Naviti 2.0 can help them finally make some in-roads. The newest Naviti has different levels of relief as they join together: Bradley is happy to have his beautiful camp back, hungry Chelsea can have a coffee, and Domenick can finally have a day without Chris. Domenick and Bradley reconvene about future plans and decided if needed they'll target Libby, who Dom calls the next Parvati. The Immunity Challenge has one member of each tribe serve as a caller to guide their blindfolded tribe members to puzzle pieces, then to instruct those blindfolded members how to solve the puzzle. Desiree is definitely the loudest caller, but the worst at instructions which causes Malolo to lose yet again. When Jacob called Malolo the greatest tribe of all time on episode one, who knew his ghost would linger and curse this tribe all season? I could probably copy and paste this section from the last few weeks. Naviti feels guilty about causing the loss but they have the numbers so they'll pick off someone from original Malolo: this week it's James. James wants to target Des and promises Angela to be loyal to her. Angela's not sure what to do to better her game and no one really knows where her head is at. Should be fun! Tribal Council time! Everyone gets situated in Malolo's home away from home and Probst calls out they're one of the worst tribes in challenges of all time. Desiree accepts full responsibility for today's loss and plans to get back up from her fall from grace. James once told his tribe it was OK to vote for him since he blew the challenge but says it depends on what the tribe prioritizes. He also says all of this with the most perfect posture which I don't think I've even seen someone sit so upright on one of those Survivor stumps. They're so close to the merge but if they keep losing, will they even get there? 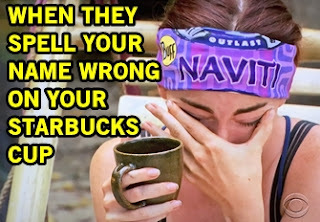 In case you forget, Kellyn reminds you there are three original Naviti so longterm relationships matter and can we please shut up about old Naviti?? James reminds them the tribes are random buff draws so maybe think outside the buff. They don't think outside the buff and the entire tribe votes off James.